JACKSON, Miss. -- Mississippi Gov. Phil Bryant signed a bill Thursday that supporters say will assure unfettered practice of religion without government interference but that opponents worry could lead to state-sanctioned discrimination against gays and lesbians. 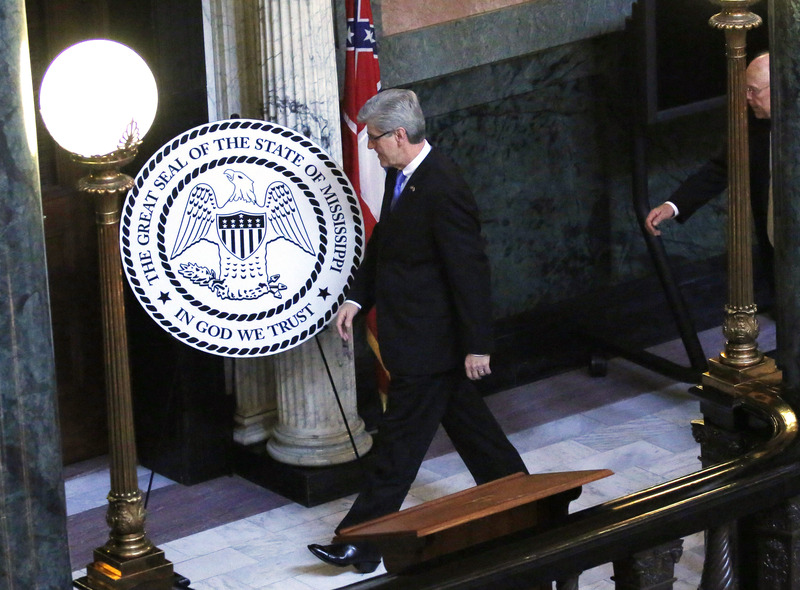 The bill, called the Mississippi Religious Freedom Restoration Act, will become law July 1. It also will add "In God We Trust" to the state seal. An early version of the bill, considered weeks ago, was similar to one Arizona's Republican governor, Jan Brewer, vetoed after business groups said it could hurt that state's economy. Supporters say the final Mississippi bill bears little resemblance to the failed Arizona measure. Outside the state Capitol on Thursday, more than 75 gay-rights supporters protested against the bill. Jeff White of Waveland, a founder of the Mississippi Gulf Coast Lesbian and Gay Community Center, said as someone who is gay and Jewish, he worries such a new law could make him more vulnerable to unfair treatment. "It's the first time in my life that I've actually considered moving out of Mississippi," said White, 32. "It made me physically ill the past few days, realizing what they're trying to do." Bryant signed the measure within hours of receiving it Thursday, during a private ceremony. The bill says government cannot put a substantial burden on the practice of religion. Though the bill is vaguely worded, supporters said an example of would be a zoning law to limit the location of a church, mosque or synagogue but not limiting the location of a secular business. The small signing ceremony was attended by a few elected officials, lobbyists for the state's influential Southern Baptist Convention and Tony Perkins, president of Family Research Council. The council, a conservative Washington-based group, has pushed states to enact laws that mirror the federal Religious Freedom Restoration Act that President Bill Clinton signed in 1993. Perkins said Mississippi becomes the 19th state to enact its own religious-practices law since 1996. "Those who understand the importance and cherish the historic understanding of religious freedom are grateful for leaders who respond to fact and not fictitious claims of those who are trying to quarantine faith within the walls of our churches or homes," Perkins said in a statement.